It's time for a Danish meal again. This time round I'm making some Benløse Fugle or as translated into English, Legless Birds, although in my house we call them Boneless Birds. 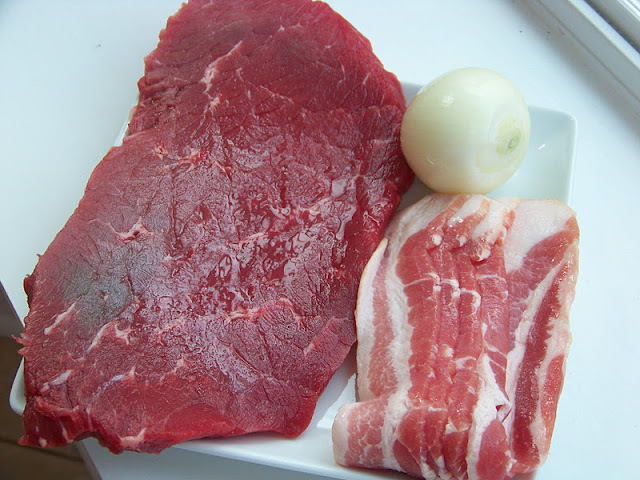 And don't get fooled by the name, this is a beef dish. This is a little more difficult to do than most of my dishes, mainly because you have to be dexterous enough to be able to tie string. (or use a toothpick to keep it together, just remember to remove the toothpicks before serving). 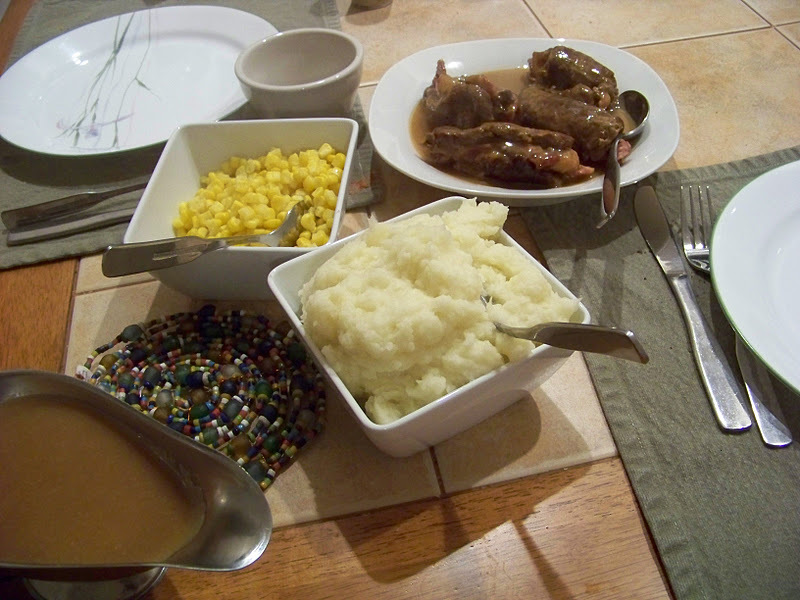 I usually figure on two pieces of meat per person. 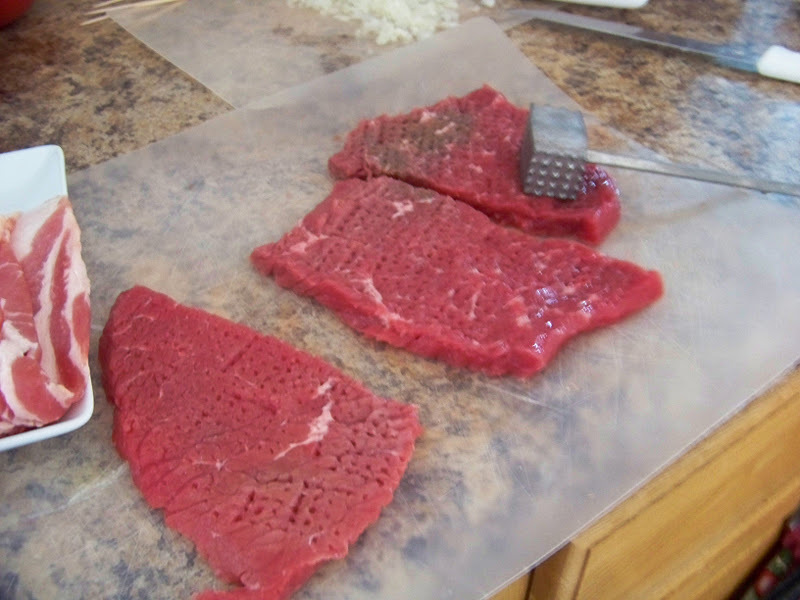 The recipe follows at the end. 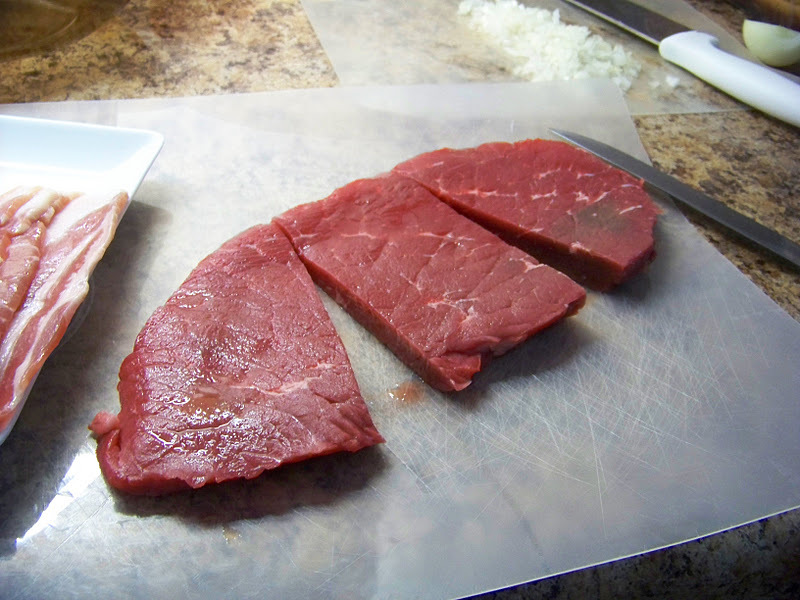 Cut the meat into 12 uniform size pieces and pound thin into approximate square shapes. 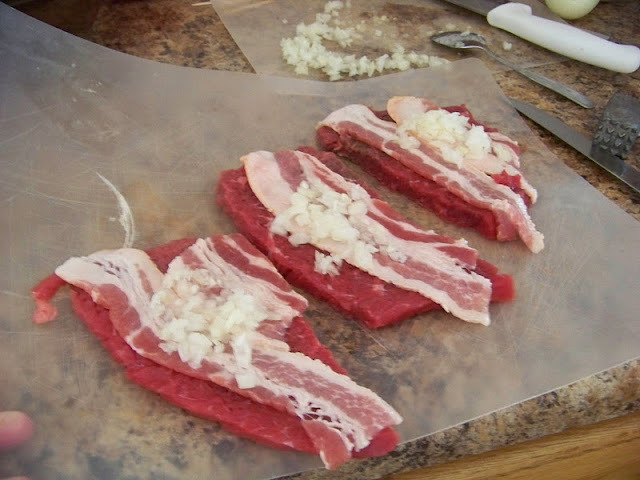 Cover each piece of meat with a thin slice of bacon, trimming them to fit, then sprinkle with salt and pepper, adding a rounded tablespoon of minced onion. Roll up and tie firmly with white thread (I keep a spool of heavy duty cotton thread in my spice drawer), taking care so the filling doesn't ooze out of the ends. Or thread a toothpick across the ends to keep it closed. Roll in the flour, coating it very lightly, and brown them in the hot butter on all sides in a moderately hot pan. 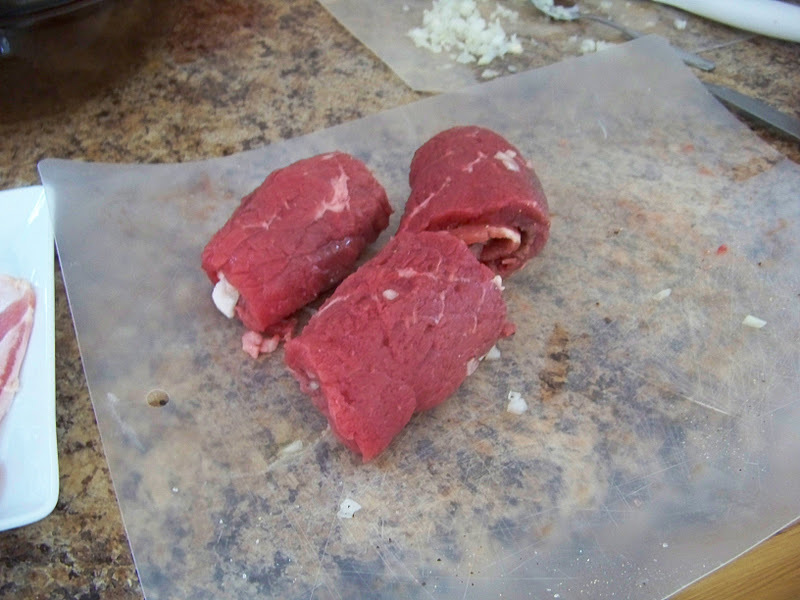 (I forgot to roll them in flour this day, whoops, tasted OK though). 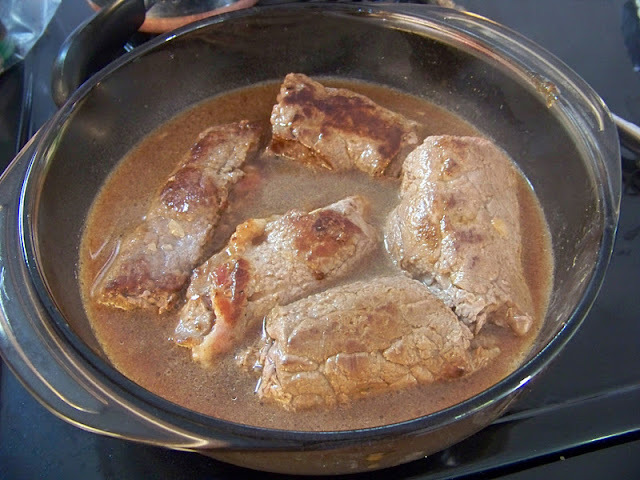 Add the beef bouillion or prepared Au Jus, cover and simmer for 1 1/2 hours, or until tender. Or place into a 325 degree oven and bake for 1 1/2 hours. Add water if necessary to keep the level of fluid up. Turn the rolls from time to time. When done, remove the 'birds' from oven or skillet, set aside while you skim the fat and thicken the liquid with a slurry of 1 tablespoon flour to 1/2 cup of ice water. Cook for a couple of minutes to thicken and to take away the 'raw' taste of the flour, then serve the 'birds' with the rich brown gravy. The bacon adds a lovely richness and great mouth feel. Serve with some potatoes or noodles and corn or your favorite vegetable. Despite the name, this has nothing to do with any kind of poultry. 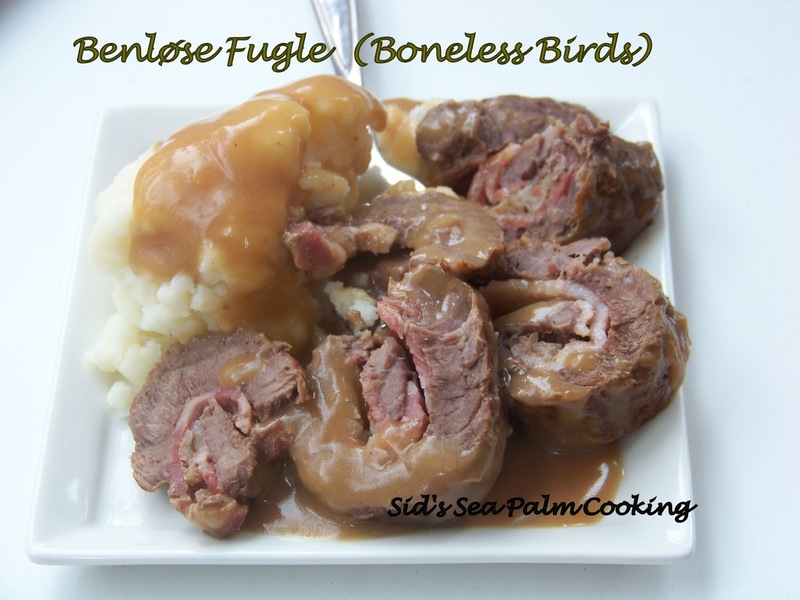 Benløse Fugle (Boneless Birds)are named that because they do resemble a boneless bird when prepared, but the beefy taste will wow you. 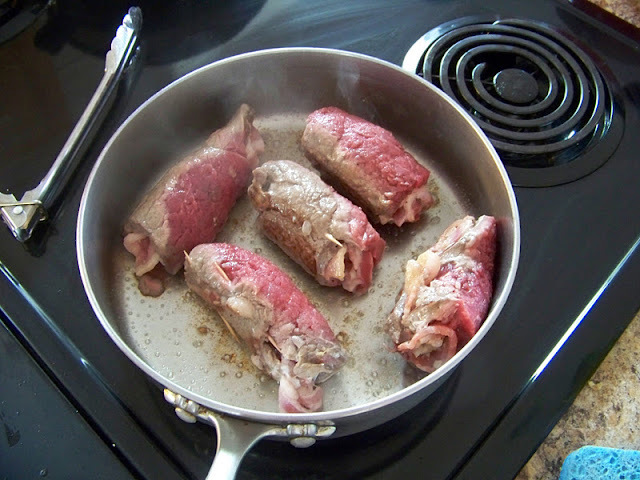 1 can (10 1/2 ounces) Beef Bouillion or 1 1/2 cups of prepared Au Jus mix. Dredge in the flour, coating it very lightly, and brown them in the hot butter on all sides in a moderately hot pan. Add water if necessary to keep the level of fluid up. Turn the rolls from time to time. When done, remove the 'birds' from oven or skillet, set aside while you skim the fat and thicken the liquid with a slurry of 1 tablespoon flour to 1/2 cup of ice water. Cook for a couple of minutes to thicken and to take away the 'raw' taste of the flour, then serve the 'birds' with the rich brown gravy. The bacon adds a lovely richness and great mouth feel. Serve with some potatoes or noodles and corn or your favorite vegetable.